We called the man with a broad smile Diamond Jim, as mocking him was easy. Being the town drunk his occupation. We were kids. What did we know? It was not until later in my life I understood that he was, indeed, Diamond Jim Brady. While I fished at the dump lake Diamond Jim would mumble directions and show me how to bait a fishing hook to catch crappie. It meant a lot to him having a friend. I found his nature was that of a kind man. His cloths were sweaty and at times smelled of stale beer. His hair was always messy. He was shy and illiterate. A kind gesture toward Diamond Jim and he would open his soul for a short moment and allow one to visit. He was so exuberant and bright when talking about fishing or boxing; a moment later he would shut down, perhaps recalling painful experiences that riveted his soul. He would walk into town from his shack, about two miles to the store. Many in town shunned Diamond Jim, yet others cordial, a few more even kind. Going back to his shack Diamond Jim would be drunker than a skunk. He would stagger down the road with a small bag of groceries in one hand and a bottle of wine or even a quart of beer in the other. One night I walked through the town’s park. It was about 10:30 pm with a street light every 300 feet or so. Not far from the park was a railroad yard. The park scattered with Oak trees and large green bushes. Not a place for a teenager such as myself to walk, especially at night. I was suddenly surrounded by stench, grabbed from behind by a pair of huge arms. One hand griped tight around my throat. The other hand took my wallet from my hip pocket. As quick as the arms grabbed me, those same arms released me. I turned in time to see the hobo fall. Standing over him was Diamond Jim. Diamond Jim mumbled for me to head home. He took my wallet from the man’s hand and tossed it too me and pointed me in the right direction. I ran home. Years later I arrived home from Vietnam. While walking through that same park I heard a mumbling to my back. I turned and there was Diamond Jim. His smile broad, tears in his eyes. He gave me a welcome home hug, a pat on the back, and a thank you. The only memorial show of kindness I received when getting back from a war. We sat and talked for hours. That was the last time I seen him alive. A few years later Diamond Jim found dead along the railroad tracks not far from his shack. He had a heart attack. He fell off a small cliff and onto the railroad tracks. He died alone. At his funeral I was the only person in attendance. A VFW Color Guard and an Army Liaison stood to my side. There pinned ceremoniously on his flag-draped coffin, was Diamond Jim’s three Purple Hearts and Two Silver Stars among several others. My salute was long and meaningful. Tears rolled down my cheeks. There is no man with more of an open heart I had met since. This man did not ask much from anyone. He harmed no one and lived his life as he thought he should. He, like so many others, will go down as an unknown soldier. His was, and remains to this day a situation not so unique. While serving our country he asked nothing in return. He did, however, expect to have our country uphold the ideologies and foundations toward freedom and all that comes with it. He was not a rock and roll star, movie star, or even got his name in the newspaper. He was a citizen living within a country he served honorably. To give is admirable — and being there when needed is the most honorable sacrifice a man can give in his short life. The Mohave Desert offers the equestrian many trails, each with a unique experience. The trails merely portals or highways to different realms, and each challenges a rider’s experience, from partially washed-out roads to trails for the expert. The highlight of trail riding in the Mohave is heading into high desert plateaus, exploring gold mines and haunted ruins, then riding over mountain ridges high above breath taking landscapes. The timid or weak with a shy horse need not apply. Camping can be challenging as well with Cougars, possums, Mohave Greens, and various stinging insects abundant. Shrill sounds of spirits, those of another world, exist within the breeze, often cloaked by the smell of sage. An odd interplay between the cosmos and the high desert flats, relay snippets, the sounds of whispering, conversations of others, or a horses nicker on the desert flats perhaps one-hundred miles away. From California’s Interstate 5 it’s an easy jog to Highway 138 east, to Highway 14 north past the Jawbone Camp site. A few miles from Jawbone is your right turn to Redrock Randsburg Road, then stick to the left, Garlock Road, at the “Y” and you will begin to realize the vastness of this land called the Mohave Desert. You have entered into the El Paso Mountains and BLM land, a small portion of the Mohave and yet filled with trails, old roads, active and played-out gold mines, and ghost towns. You will run across a prospector or two and a few pet cemeteries still in use, and century old homesteader burial plots. Because of the remoteness, driving directions approximate at best. This situation is taken as a sign to flatlanders or city dwellers to stay away. To a true and awe inspired equestrian, and other adventurers, the expectation of something different, something unique about to happen, but what? 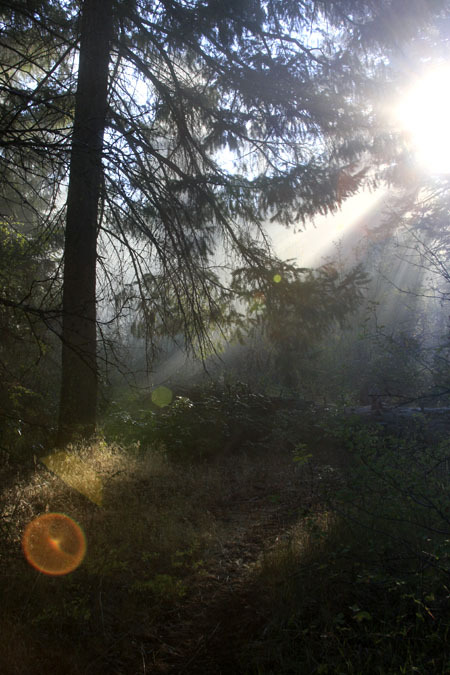 Past the Devil’s Backbone, then turning onto Garlock Road and about 4 miles from the “Y” you will see a stand of Scrub Oak trees, with a rolling dirt road to the trees front, which is on the left hand side as you head east. The challenges and mystical environment of the area begins here. You will need a good four-wheel drive truck and a sound trailer to head up and into the mountains at this point. Going past a pet cemetery dotted with small American Flags and a couple of unique trash piles (rummaging through the pile is a step into history), then over a large hump in the road and you come to a landing and what is used as a horse camp. This is about five miles into another land, and you discover quickly you are simply a visitor, and attention must be paid. Many prospectors use it as well. Gold is also abundant here. From here it is flat and an easy unload/load for your horses. Also you will see a catacomb of roads to take for your day or weekend ride. All roads lead to many other roads, gong over the mountain or through a small pass near the flats. It is mountainous and high desert so water, first aid kit, snake bite kit and a little food and a warm jacket is needed. Mohave Greens live here so be careful and watch out for them, very poisonous. Some riders take along a metal detector as gold is found a few times a week and depending on the amount of prospectors in the area at any given time. You will pass by many Claim Sites already filed with the assay office at the BLM. These are off limits to the public. Most Claims are owned by Gold Mining Clubs that restrict a particular number of memberships to certain areas. They are careful about how many members prospect their Claimed Sites, so you may run across one of these members who will ask you if you’re prospecting or not, and whether or not you are a member of their organization. The roads and trails are public access and BLM land open to the public, only the mining may be restricted in certain areas. 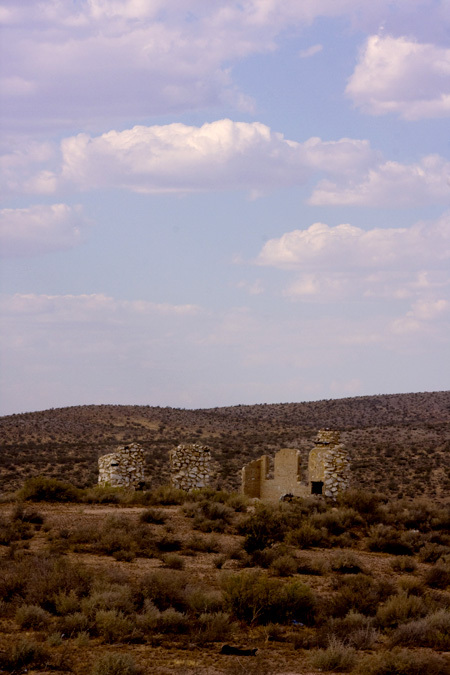 Ghost towns in the area can be found by the rider, but look close as you can miss the sites. Nestled within one canyon, easily overlooked, sits what remains of an old general store, the remains of a blacksmith shop next door, and the ruins of a small saloon. Rumor has it that the concubine of the saloon owner kept the saloon in operation. The owner went off to World War I, his concubine waiting at the front window of the small shed, next to the saloon, for his return. She eventually committed suicide. The letter giving her notice of her lover’s death in the war still gripped tight in her hand; all the while she swung from a rafter above the tipped chair and inside the same shed where she waited. It’s claimed his spirit and hers eventually found one another, with both traversing through the ruins and the canyons nightly, their shrill cry’s of longing for one another sad, remorseful. The saloon built of wood in the late 1800’s, so not much other than floor beams, corner posts and two or three lingering, vocal, ghosts remain. Could they be the lover’s and why some assume they indeed come together? Or are they lonely spirits lost in the transition or our cosmos, stranded indefinitely? At night and back at the horse camp and around the campfire the night breeze through the passes, make the sounds of souls searching for their mates. Perhaps the ghost tales true from the old general store and saloon, as the wind-sounds are eerie, begging for acceptance, always searching. More small enclaves exist throughout the area so it is up to each rider to locate them and wonder about the history, the tales, and the legends. Yes, the spirits that remain and sing their songs of loneliness carried by the constant desert breeze is a true desert song. Horse and rider take a front seat here, to every occasion. Through the passes and to the ears that listen brings perhaps a tear to the eye, with that uncommon knowledge that you and your horse shared an occult occurrence, or something mystical in nature. Yet, within your own heart, you discover the hope or dreams of each small sound prevalent, ironically cheerful as resolution in the air of the healed broken hearts that exist, despite the tragedy, and that somehow acknowledged by horse and rider – the bond — into an odd acceptable resolution. Or not!